Earlier this year, while researching sources for instrument woods, I stumbled upon a link to Exotic Hardwoods of Sicklerville, NJ, which is only about 10 miles from where I live. I say stumbled upon, because I had been searching for “guitar woods” and “Luthier supplies,” but in desperation I finally searched for “Exotic woods,” and Bingo. 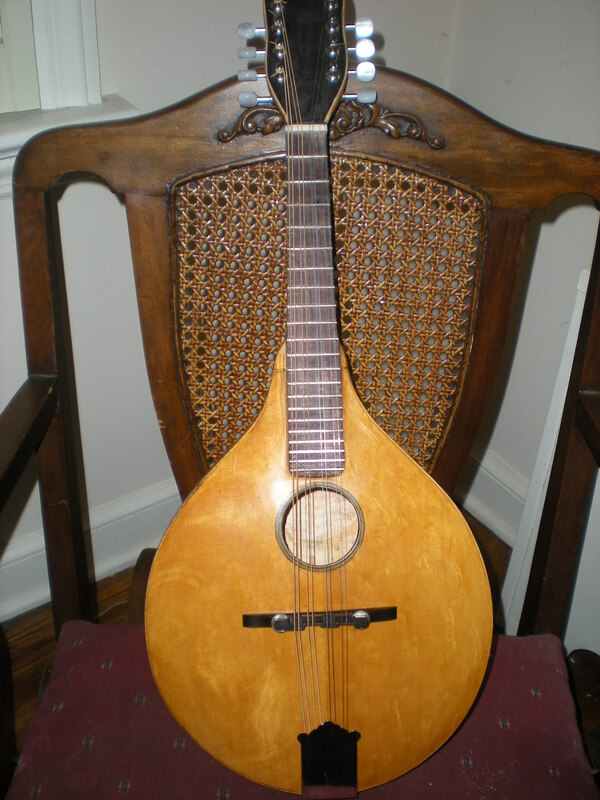 I remembered this place, I had been there a few years ago to get a fretboard and I think mahogany for a neck, but hadn’t remembered it until I saw the listing. It’s on a typical outer suburban road, an unassuming white house with a driveway that leads to two small warehouses in back. The man and woman who work the yard and shop greeted me, asked what I was looking for, and then sent me in to get a sales slip from the owner so that we could start picking. I started chatting with the owner, an older man of Indian heritage, and we ended up talking for about an hour. He flies all over the world and hand picks each shipment of wood, so that he doesn’t end up with junk, and from the way he talks about the woods, it’s clear that this is a labor of love, as well as an enviable lifestyle for someone of a similar mind. But in that hour, there were no other customers coming in, and when he started talking about being 72 and a little weary of it all, I mentioned that if he increased his web presense, maybe adding some pertinent key words (as If I know how to increase web presense! )he could maybe increase business to make it more worthwhile. He smiled tolerantly, and when I was finished, he told me that 95% of his business is selling to makers like Gibson and Martin. In fact, there was a pallet of mahogany outside, 16″X2″X 16 feet long and straight as the day is long that was being shipped out to be made into Les Pauls at the Gibson factory. Having been totally schooled by the old guy, I headed out into the yard, where the two people I mentioned gave me their full attention for the duration. I need a couple mahogany neck blanks, here they are, hundreds of them, pick the ones you want. Same with the Rosewood back and side sets, all matched and numbered and in leaning stacks of 50 or so per stack, take your time, find the set you want I was told, so I did. 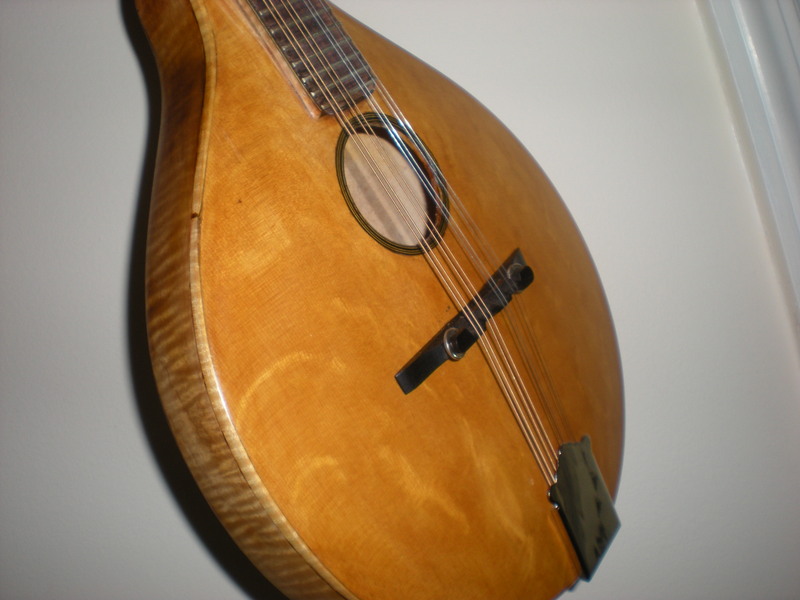 I needed flamed maple mandolin backs and sides, which sent them searching all over the warehouse, as it’s not something they sell a lot of. What they came up with was violin backs and sides, which were beautiful, but at 1 7/8″ thick, twice as thick as I needed, which was not a problem, the guy just ripped it in half on his monster bandsaw, giving me two back sets for the price of one, and he threw an extra side set in to go with it. I poked around for a while, got some other stuff, then as they were writing the slip, they asked me if I wanted any of the cutoffs that were stacked by the gang saw, so I took 4 or 5 of the Les Paul mahogany pieces, 16X12X2, figuring I’d do something with them. I’ve ended up making kalimbas from them, I can get 2 or 3 from each. I think you can imagine that I didn’t want to leave, but I was out of money. Another cordial conversation with the owner, who asked me to bring pictures next time, and I left. Driving home, I was struck by my good fortune at living so close to a place that any instrument maker should visit, but probably won’t because there is no other reason to visit Sicklerville, NJ. I felt like a surfer living next to Wakiki, or a skier who lives on Mt. Blanc. But if you order from the website, I can pretty much guarantee you won’t be disappointed. They have no junk to sell you. I’ll be going back soon, bringing pictures. I pretty much followed the blueprint for this, though Iused a round hole of the same area instead of the original oval. 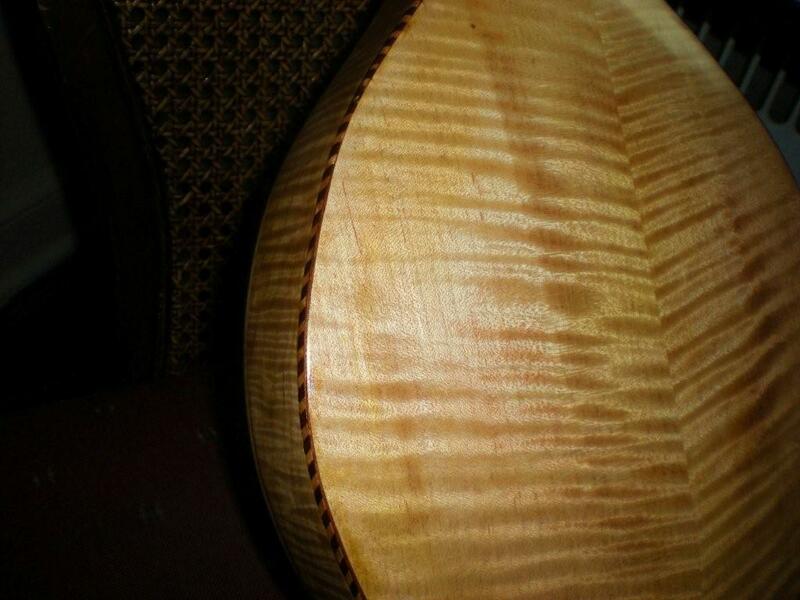 The back is European flamed maple, intended for violin backs and purchased from Exotic Woods of Sicklerville, Nj. I’ll have to write more about them later. The top is Alaskan Englemann Spruce and the neck is a 3 piece laminatiom of maple and rosewood with a non adjustable truss rod. The headstock is a rosewood veneer. I was really enjoying the Superman/Lex Luthier metaphor, but I have to mix it up here. and industrialist and designer, and has had to defend that position publicly to Loar’s many devotees. But Loar’s workbench, pictured here, Is that of a craftsman as well, and closely mimics the chaotic nature of mine, which gives me hope. arrows can be found there. that’s likely not even a goal, they just want to own and play an instrument that they can proudly claim to have built themselves. to go home and build a Chevy in your garage. about making instruments, that’s where my money would go first. and effort into building a jig. edges. Check against the original before using. compensate for faulty design. Roger’s modification is to keep the V shape and eliminate the dovetail, securing the joint by pinning it with dowels. adjusted at some point in its life. hardware based (bolt on, i.e.) joints.